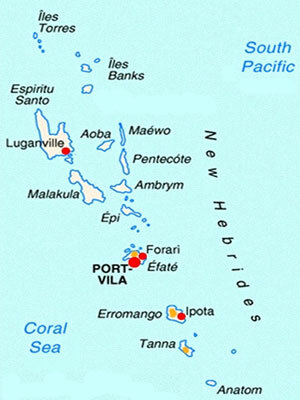 Vanuatu comprises a chain of some 86 islands whose total area covers 60 times more sea water than land surface. This makes for one of the most cyclone prone regions on Earth where cacáo has survived since the late 1800s. The first cacáo introductions probably came from PNG CCI (Cocoa – Coconut Institute) in the form of Amelonado. A later watershed occurred with national independence in 1980 that was pivotal for Vanuatu as a whole. It handed land back to “traditional” owners. Today a few large holdover properties are still left but cocoa production is mostly smallholder. Traditional land tenure means property theoretically belongs to no one but crops on it do. Planting trees has become a way of exercising semi-permanent control over acreage. Ergo, the reason for mass planting of cacáo by smallholders. In the wake of independence, an ambitious clonal program was launched with 72 genotypes planted in one nursery plot alone. Even more varieties were introduced ​​in 1996 & beyond, including IFC clones; Na 79; Nanay & Iquitos from Peru; ICS 84 from Trinidad; Amelonado out of Côte d’Ivoire; Mexican Criollo; Venezuela Porcelana; plus Lafi from nearby Samoa. Indeed, trees transplanted on these little islands from all over the globe form a cornucopia of cacáo’s genetics. Toss in Gliricidia, Inga edulis & Erythrina for shade & the forest feels complete. As elsewhere with cacáo, crop protection challenges even the most skilled growers. The main problems encountered in Vanuatu are fungus (Phytophthora sp) causing pod rot & defoliator insect naemd ‘Rose Beetle’ (Adoretus versutus).